The user SYSTEM dialed a con­nec­tion named for­tissl which has failed. The error code returned on fail­ure is 633. You have to, remove ipv6 from net­work set­ting. This entry was posted in 2013, APLICATION, Forticlient, GUIDE. I have unticked the Inter­net Pro­to­col Ver­sion 6 block, but con­nec­tion still hangs on 98. How do I fix? Hi, have you found a fix for this? I’ve been try­ing to find a fix for hours with no luck..
LdkJera any luck find­ing a solu­tion? 12play cipaflo­res­cu LdkJera What do you mean cre­ate a IPSEC VPN con­nec­tion? How do you do this ? 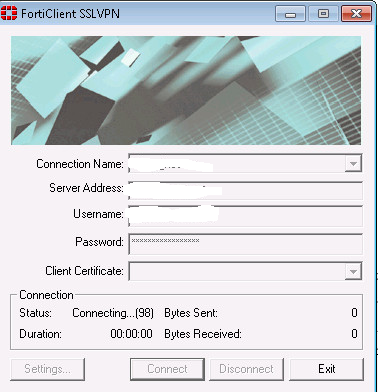 Watch the video and use the oth­er link as a ref­er­ence..
After cre­at­ing the VPN con­nec­tion in Foti­Client, a net­work con­nec­tion is cre­at­ed called for­tissl.